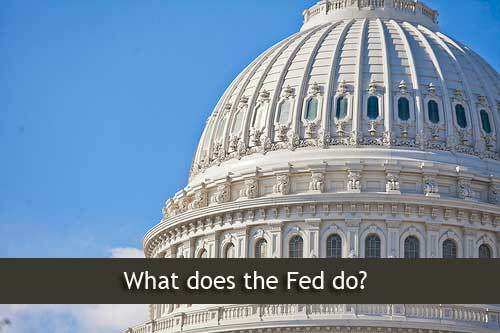 Who is the Fed and What Is It Doing With Your Money? The Fed, aka the Federal Reserve, has been making more headlines since the housing collapse of a few years ago than at any time in its history, thanks largely to its ongoing but fading stimulus program aimed at keeping interest rates low. But the Fed does far more than that. Like a puppet master in the shadows pulling strings, the Federal Reserve makes decisions that affect the financial health of everybody in the US – and many abroad. The nation’s central bank is tasked with regulating the flow of money throughout the economy. Its gatekeeper committees and subcommittees oversee everything from interest rates to inflation as it holds back or introduces money into the system. That’s how the Fed gained its current level of consumer recognition. The housing bubble that peaked and then burst around 2008 had devastating ripple effects throughout the e3conmomuy as a whole. As homeowners across the country defaulted on mortgages and lost homes to foreclosure, the economy as a whole flattened. So the Fed stepped in with a large-scale stimulus program known formally as Qualitative Easing version 3, a plan that involved the buying of billions of mortgage backed securities from the nation’s big banks each month. That. The Fed argued, would allow those banks to keep interest levels low and encourage the recovery of housing and other aspects of the economy. But while the progress of the stimulus has gained the Fed some public scrutiny in recent months, it’s done little to lift the veil on the Fed’s relationship to those megabanks deemed too big to fail, the world’s money markets and you – yes, you, the American taxpayer. The stimulus and its effect on interest rates touch everybody who’s looking to take out a loan, particularly for a home mortgage. Because QE3 was originally aimed at propping up the housing industry after the collapse, mortgage interest rates fell to historically low levels and have remained relatively low even as the Fed takes steps to taper down the stimulus thanks to improving job rates and consumer indexes. Those low rates also trickle out into other kinds of loans as well, since the stimulus allows banks to adjust rates down on consumer credit purchases of items like cars and appliances too. But critics of the stimulus, some of whom are employees of regional branches of the Fed, point out that the nations large banks can still set their own rates and charge customers higher fees on transactions as well. Probably nothing the Fed does has more of a direct effect on consumers than adjusting rates of inflation and deflation – the value of the dollar relative to its purchasing power. While it may seem that the best rate of inflation is no inflation at all, the Fed actually considers mild inflation to be completely acceptable. And it has the power to adjust those rates accordingly. That’s not all bad, as Jason Hartman points out. As the value of the dollar goes down, so does the value of debt –meaning that a person with a home loan can end up paying less on that loan than its original value, since the dollar is worth less than it did when the loan was new. Whether or not you hold an account with one of the country’s biggest banks, such as Citigroup, Bank of America, Wells Fargo or JP Morgan Chase, you’ve been affected by the malfeasance of those banks in the recent past. They’ve all been implicated in bad behavior stemming from the housing collapse that includes misrepresentation, fraud and outright criminal activity. The Department of Justice, backed by the Fed, launched a number of investigations that led to multibillion-dollar fines and settlements on the part of Bank of America, Citgroup and Chase as well as a number of smaller satellite institutions. Victims in some pf the suits got settlements too. But because a fine in the millions of dollars is mere pocket change to an institution that can’t be allowed to fail, those banks continue to operate, passing along the costs of those legal actions to customers in the form of fees and rates. Those bad banking practices led to the creation of the Dodd frank Act in 2010 – a sweeping piece of consumer protection legislation aimed at protecting consumers and imposing tighter standards – and penalties – on the banks themselves. Because of the Dodd Frank Act, the Fed now conducts annual “stress tests” – a review of a bank’s assets and outlay to determine its overall stability and health. The test allows the Fed to pinpoint problem areas and intervene before the bank is in danger of failing. Though the Fed’s stress tests are aimed at the bank itself, not consumers, the results are passed along in the form of customer service, accountability and even the opening and closing of bank branches in various parts of the country. Think that global money markets don’t affect the average American with o offshore assets? Think again. The Fed is active in the world’s currency exchanges too, with ties to the international banking rate setter LIBOR and others. Those rates set the value of the dollar relative to the currencies of other countries and the related interest rates. And that affects the rate and costs of importing and exporting goods as well as the exchange rates for currency conversion and other international financial activity. Whether you’re a tourist, entrepreneur or investor, the Fed’s behavior on the world scene affects your financial decisions.